So Monday was a little exciting here in the big city. After work I started walking home and ended up ducking into a building to escape a rather dramatic rain storm. Turns out Toronto received 90mm of rain in 2 hours. The average rainfall for the month of July is usually 75mm. Unfortunately I left the windows of my apartment open and had a wee bit of water to deal with when I got home. Then I lost power for about 24 hours and wasn't able to deal with the water in my carpet. Today I got home and my apartment smells like a swamp. The worst part was almost all of my shoes were stored under my bed in fabric storage cases. Many were soaked and I have yet to determine the full extent of the damage. Hopefully they will be ok. Here's what I wore on Monday before the drenching. I bought these shoes my second day living in Toronto and this is the second time I've worn them. The first time was out for drinks with a former coworker from Halifax. I'm glad I got them when I did since they aren't on the Fluevog website anymore. They're pretty comfortable though they did rub a bit on my right ankle. I just slapped a bandaid on and carried on with my day. Luckily I wasn't wearing these during the extreme deluge. I didn't take any pictures on Tuesday or Wednesday since I was looking less than camera ready. These shoes were thrown in the garbage when I got home. I'd only worn them about 4 times and a lot of the glittery bits from them had fallen off. Plus they made my feet sweat terribly. Life's too short to wear crappy shoes. 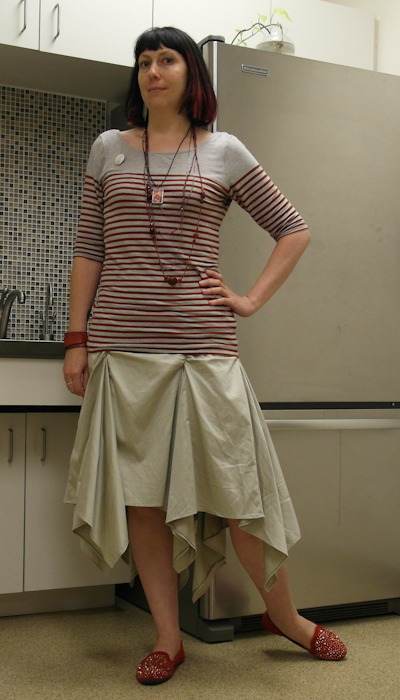 I love this skirt but it wrinkles easily. It has a nice drape though. A new pair of shoes was waiting for me when I got home so throwing these ones out wasn't such a hardship. Tomorrow is Friday! I'm in love! I really hope that your shoes didn't get too much damage! That sounds just awful! I saw the pictures on the news of the flooding - Yikes! First San Antonio, then Calgary, now Toronto. I guess we'll all be buying those plastic shoes and boots soon! I hope there was no lasting damage for you. Surely someone sells shoe insurance. Insurers should get on that if they don't! I hope your shoes survive. I saw about the Toronto weather on the news here. Gaaa. 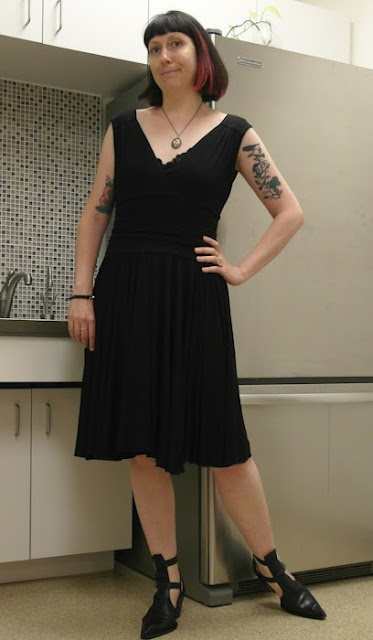 You're gorgeous in both of these outfits, but I'm in the mood for black. Lovely, dark. I hope all your fabulous shoes will be ok!, I love them so much! Love your skirt shape and that striped t-shirt!! I'm so sorry about the damage to your shoes! This is such a rainy summer. It's nuts. Ack! NOt the SHOES!! I hope they all dry out ok. I have managed to soak a couple of pairs of my faves getting caught in a surprise downpour and when I just left them to dry on their own, they were ok. I saw the flooding in TO on the news - is this going to be the summer where we have to build an Ark?? You are soo right, life IS too short to wear crappy shoes. I'm selling a bunch of mine off because of my foot problems, and if I can't wear them, it just irritates me having them and not being able to wear them. What size do you wear? Eep! Shoes! Hope they dry out ok. Love the proportions of the red stripe top with the pleats of the skirt.